HRC 555 Headed Rebar - Headed Reinforcement Corp.
HRC 555 headed reinforcing bar is a deformed or plain steel bar with a head attached to one or both ends. HRC 555 reduces anchorage length, congestion, and construction time while providing superior performance. 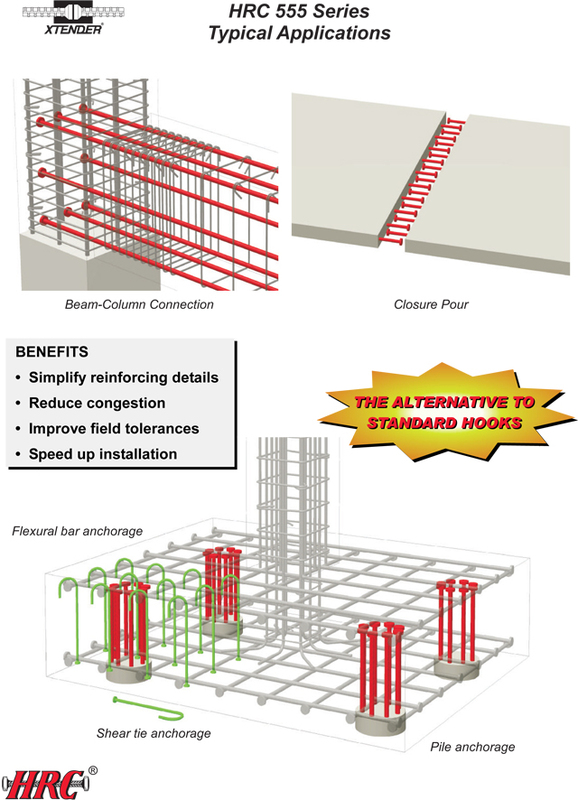 A great alternative to standard hooks throughout your concrete structure, from pile anchorage to beam/column joints. Research has shown headed lap splices are very effective for closure pours and according the Section 12.6 of ACI 318-08 the HRC 555 Series headed bars have the shortest required development length compared to standard hooks or straight bars. Great for closure pours and other locations not permitting the length of conventional lap splices. The use of Headed Reinforcement improves the form, fit and functional performance of reinforced concrete structures at a low cost. The concrete also benefits because adequate space for pouring and vibrating will give better concrete consolidation. Reduced congestion and the ease of placing Headed Reinforcement will improve constructability and speed up the project.